Welcome to the voting round for the Nicest Blogger! Voting will last a week from July 28, 12:00 AM EST, to August 4, 11:59 PM EST. Please only vote once, do not cheat, and scroll down for the Well-Known category! I believe Kindles & Wine deserves the award for Nicest Bloggers because they all handle themselves with such grace and humility. Each of the bloggers reviews books honestly, but when they need to add in something they did not especially like about a book, they have a way of doing it without attacking the author. They are very interactive with their blog and try to comment on each response they receive from readers. You can tell they really appreciate each and every reader/commenter. The communication when you win a prize or just have a question is very quick and helpful, which shows their character as well. I have gone to Kindle Gal in the past with questions when I started my blog, and she was nothing but helpful and encouraging. You can tell that Kindles & Wine is very reader-oriented. They have asked readers what we want to see on their blog in their second year of existence, and I have no doubt they will take that to heart when planning their schedule. They are the most approachable and interactive book blog I have encountered lately and wish them the best of luck in the Bloggy Awards and with the future of their blog." I've been a follower of Kindles & Wine from the beginning, drawn in by the welcoming Kindle Gal herself. She makes a point to make every new friend and follower feel welcome, and it's in this spirit of inclusion, expressed through Kindles & Wine and from all her blogmates, that those who visit her blog instantly become family. The generosity of the blog speaks for itself: on their 1-year blogiversary, the readers were offered the chance to win one of 52 book prize packages, and all of the work and time dedicated in accomplishing that stellar feat was done solely for the love of their followers. Care to browse the reviews? If you take a look at the DNFs, the Ds, and the Cs, you will see caring reviewers who break the news gently, explaining their justification with detail and humbleness about their opinion. Kindles & Wine happens to be the nicest bloggers for who they are; their kindness and love is felt in every word and gesture." I started following Kindles & Wine when I first began reviewing novels, hoping to get some tips. The reviews done by Kindle Gal and her blogmates are always interesting, fun, and honest. I am also impressed because if you leave a comment, you will get a personal response, which is not the fact on some blog sites. I feel like I have become friends with these very talented women and highly recommend Kindles & Wine for the Nicest Bloggers award." I've only started chatting with Zoe a couple of months ago, but I have to say that she is one of the nicest, if not the nicest, blogger I've ever met! She just has that special aura about her that gives off this lovely and lively feeling! She throws complements out left, right and centre! Seriously, you can't help but smile when talking to Zoe! I understand why Bookhi has so many followers, because everyone wants to be Zoe's friend! She's so friendly! She leaves meaningful comments on blog posts and her blog is one of my favourites. Zoe is definitely a top contender for Nicest Blogger, so look out everyone. She is officially one of the most amazing people ever! Zoe, Zoe, Zoe... hmmm what to say about her? Oh you know, only that she's the most freakin' awesome blogger ever! I can't just tell, but I KNOW she cares about each and every one of her followers, and this is demonstrated through the meaningful comments she leaves on other people's blogs in return. Heck, I receive an essay from her on every single one of my posts and I know others do too! If she's not leaving one of these super long messages on your blog, emailing one of the many bloggy friends she has effortlessly made, chatting in a Goodreads group, writing a quirky tweet to brighten everybody's day or adding a new blogger as a friend on Goodreads... then woah, I think she may have spontaneously combusted 'cos if I know Zoe, which I think I do, she doesn't do anything other than fangirling and being generally awesome towards other bloggers! IF I EVER MET THIS GIRL THEN I WOULD EXPLODE WITH HAPPINESS. I can’t think of a time when I thought of Zoe that ‘awesomely epically freaking cool’ did not come to mind...and when we are fangirling about The Infernal Devices and fighting over book boyfriends *cough* Will and Jem are MINE *cough* I am just grinning the entire time, She makes you smile, Zoe does. And if you don’t know her THEN REALLY WHAT IS WRONG WITH YOU GO MAKE FRIENDS SHE WILL BRIGHTEN UP YOUR DAY! So...Sorry for the over use of caps lock, I tend to just leave it on when I am talking about something, or someone I fricking adore...But: this is why I think Zoe is the ‘nicest blogger’ ever, I hope you think so too. Hi I'm Sunny, The Aussie Book Loving Teen behind A Sunny Spot (A YA Book Blog). Nerdfighter, Tribute, Swiftie, Shadowhunter and Geek. My favourite authors are John Green and Cassandra Clare and I have a slight obsession with the colour pink. Thank you so much to everyone who got me this far and nominated me, it truly means a lot. I'm pretty sure that when Sunny was named, it was some sort of prediction about her personality! Sunny really is one of the friendliest, sunniest bloggers ever & she never fails to brighten my day. :) She leaves such lovely, long, considerate comments on loads of my posts and sends the BEST emails ever. =) She's so friendly towards every single one of her readers and I think it's just impossible for her to be mean to anyone! 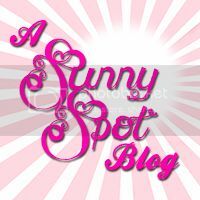 A Sunny Spot blog really is a evidence of her bubbly personality, and her Twitter account is just further proof of how sweet she is. Sunny, aww she is just so nice! She is one of my very first bloggy friends, from when I first started blogging. She welcomed me into the blogosphere immediately as a friend! She is one of the friendliest people I've ever met! She loves to interact with other bloggers and is always making new friends. Sunny leaves the most meaningful comments on blog posts! Seriously, she's had some blogger in tears with her comments, happy tears of course! She never has a bad thing to say about anybody! Even her reviews showcase her kindness. The first thing that pops to mind when you first meet Sunny is how nice she is! She is definitely a top contender for Nicest Blogger!! I feel so honored to be nominated for this award! Thank you so much to everybody who nominated me, this whole award just blows my mind. Thank you for putting me in the same category as all of these other kind-beyond-compare bloggers! There is no better blogger I can think of than Eileen (***Singing and Reading in the Rain***) for Nicest Blogger. Not only has she been a friend and follower since the very beginning of my blog (and even before! ), but she answered my constant and probably stupid questions that I had when figuring out where all the widgets and gadgets were! Eileen sent me two wonderful books – and for no reason at all! She never asked for anything except that the books go to a great home (I’d like to say I held my end of the bargain!). She has not once ignored a tweet sent by me, and I can count on her to chat with me on Twitter. I’m honored and gratified by her kindness every day. Once you meet her, you can’t NOT love her and her benevolence! - Alyssa @ The Eater of Books! So not quite once upon a time, in a land not so far away, there was a girl named Eileen who I formally pronounce as one of the nicest people I know. Honestly, she's so nice it's not even funny. Because I am just envious of all her niceness and it is not fair. She's the kind of person that'll secretly add more to your gifts and not tell you, and is happy to make other people happy. She's so selfless and kind, as well as totally easy to talk to! And have I told you how funny and awesome she is, because it's the truth that cannot be denied. You can just tweet Eileen something completely random, and she won't think you're weird, but instead tweet you something random back! You can gush and rant about things with her at any time, and whenever you need her she's always there. But I realize I'm just one person, and even though I can go on and on (and believe me I can go on and on) about how much I love Eileen, you might not fully believe me. So I dare you to ask anybody that knows her and they will tell you just how amazing she is too! She goes above and beyond for her friends, even planning an entire twitter birthday party, and just all the love goes out to Eileen! I know she'll go on to greatness, like be recognized for her extreme niceness by some official corporation that sounds really fancy, or be handed a grammy for best singer by Taylor Swift, and I'll just be proud to say I knew her. Amy, aka Book Loving Mom, is one of the NICEST freaking bloggers I have had the pleasure of "meeting". Not only is she super friendly, she's attentive, generous, caring, and considerate...plus a million other wonderful adjectives! Ever since the beginning, Amy has been a consistent commenter on my blog and I always look forward to hearing her thoughts on my posts. And it's not just me! She comments on TONS of blogs, religiously! I'm amazed! It's very rare to have someone take so much time out of their day to comment on not just a couple blogs, but as many her free time allows. And it's not just meaningless comments either. You can really tell Amy took the time out to actually read your post and comment accordingly. You don't get much better than that. That's in addition to all the Twitter love she gives fellow bloggers and friends. I love that no matter what I do in the blogging world, I will always have a great friend like Amy there to support me. She truly is one of the nicest bloggers, or person in general, out there! Love ya babe! Remember, voting lasts a week until August 4, 11:59 PM EST. Please only vote once and do not cheat! Scroll down for the next category, Well-Known, and good luck!